the couple of things on the left of the card are just a little bit of the nice package Denise sent me. Hop on over and enter one of her challenges, you'll be nicely rewarded if you win. 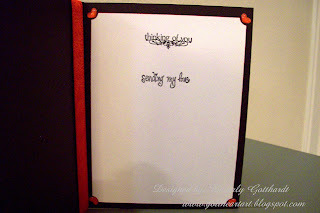 She mentioned the challenge over at http://stamptacularsundaychallenge.blogspot.com for some reason I had missed getting that one on my list and the challenge fit perfect for me to use some of my prize. Supplies: Card Blank Black 61/2" X 5" Value Pack Hobby Lobby, Designer paper-K&Co.-Brenda Walton Sweet Talk Pad, white card stock from my stash, ribbon-Michael's, CTMH markers-Holiday Red, Grey Wool, LePlumeII-grey, Ink: Ranger Archival Ink-Jet Black, Stamps: Studio G-VS4911 Series7, Series 11, metal dot stickers, Michael Richards stickers, small red heart stickers. Another terrific card! Red is my favorite color! Glad you were able to use the things you won! Wonderful! What a fabulous card! Love the red colors! Great details and gorgous paper. Great card! Love the details! Thanks so much for joining us at SSC this week! What an adorable card! Love the collar embellishment...so adorable! I'm so glad you were able to join us on the Stamptacular Sunday Challenge this week! Fab card, I love the colours and your embellishments. Thanks for joining us at SSC. 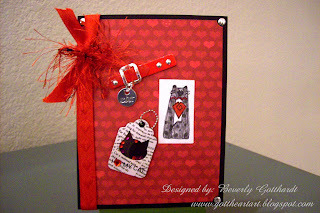 Fantastic card Beverly, the red is gorgeous as are the cats and detail. Thanks for playing along with us this week over on SSC.